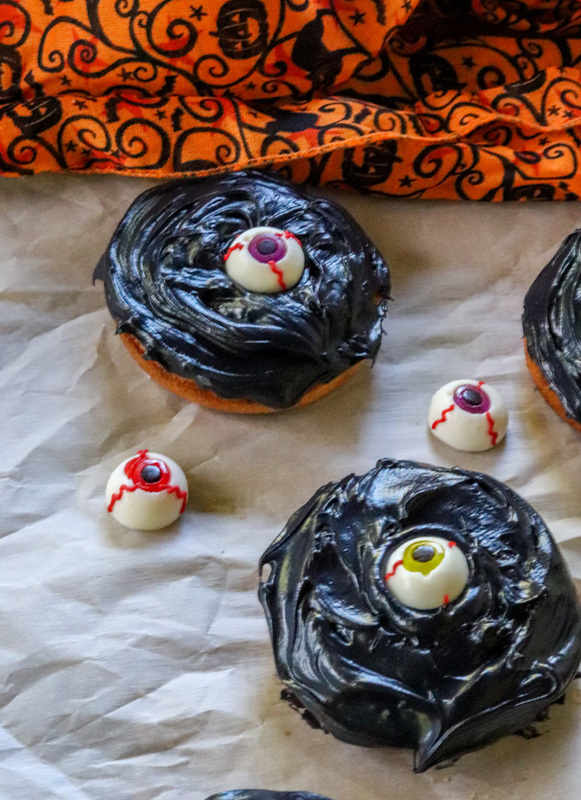 A little spooky fun turns this easy vanilla baked donut into a fun Halloween treat. 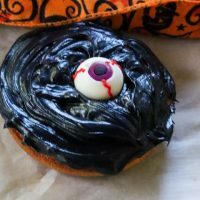 Creepy Eyeball Donuts are a just the perfect amount of spooky, when you’re looking for something easy, delicious and fun. This recipe was created for #HalloweenTreatsWeek! I was sent samples by some of the sponsor companies but as always opinions are 100% mine. It’s October 1st and that means it’s time to start thinking about Halloween. Halloween is a little different when you have a kid that’s scared of his own shadow. Spooky and creepy things aren’t really his thing. So I have to be innovative when coming up with ideas for things he might like. Or that he won’t be scared of. Well, we like donuts a lot and I make them often so I figured I’d do something with his favorite treat, right? I kept thinking about what I could do, so why not customize some donuts and make them into these fun Creepy Eyeball Donuts. A little less scary than some of the other treats we could do. In fairness, he’s only two. Carsyn doesn’t like scary things at all. And he’s not a fan of gross things either. I wasn’t sure how he’d do with these but he did great. In fact, he didn’t seem to mind the black frosting that got all over his hands, or the eyeball on top which he loved and immediately reached for more. Today is the first day of #HalloweenTreatsWeek. A week long adventure where a group of bloggers gets together and shares plenty of Halloween Treats recipes to keep you busy the whole month. 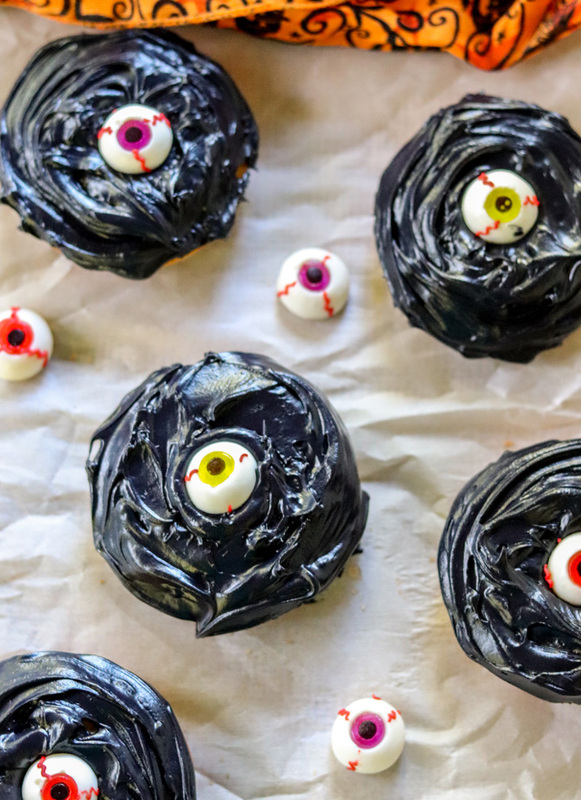 These Creepy Eyeball Donuts I am kicking the week off with, are actually delicious. 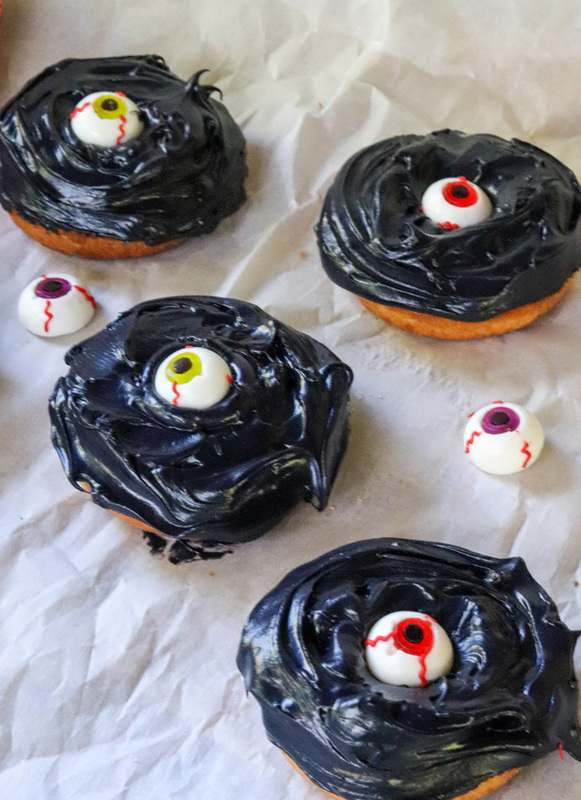 They are a simple, easy baked Vanilla Donut, with a homemade frosting turned black, and topped with a sweet gummy eyeball. Just spooky enough to appeal to the young crowd, but still creepy enough to fit right in. 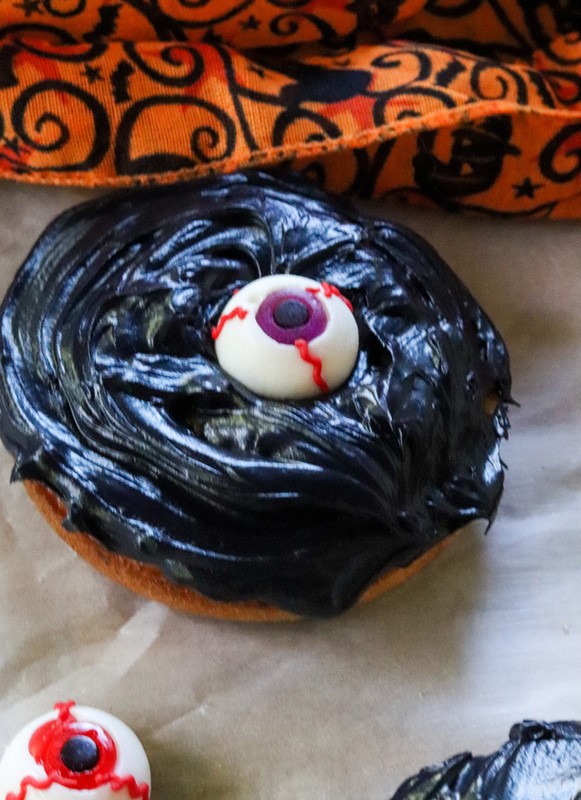 Creepy Eyeball Donuts are a fun and festive way to celebrate Halloween with the little ones in your life. Different sized donut pans will yield more or less. We made regular donut shop sized donuts. Hey! Your doughnuts are looking at me! lol So cute and fun!